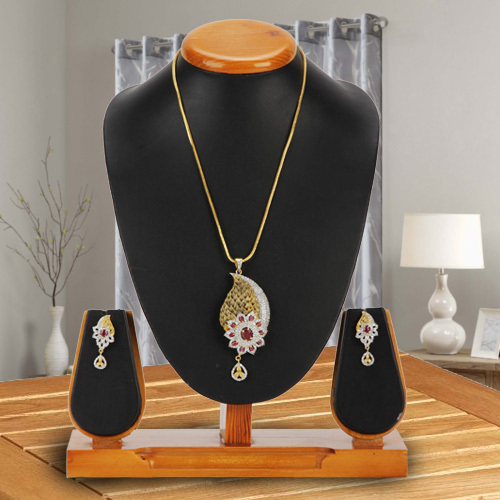 Order online this Flowing Dazzle Pendent and Earrings Set for your very own fair lady and make a hearty attempt in compensating your lack of time-spending with her. This enchanting Pack is made up of a rakish Gold Plated Neck Wear, coming with a marvelous Peacock and Flower Textured Locket, and a bewildering pair of similarly textured Ear Tops. Both the Locket and the Ear Tops are enhanced with Red Stones.